With housing prices still rising, albeit more slowly, inquiring minds might be wondering about "Real" interest rates and the "Real" CPI? I believe the CPI is hugely distorted, but not for the same reasons as everyone else. Home prices used to be in the CPI but the BLS now uses OER (Owners' Equivalent Rent). OER is a measure of actual rental prices as well as fiction. If you find that preposterous, You are not the only one. Regardless, rental prices are simply not a valid measure of home prices. 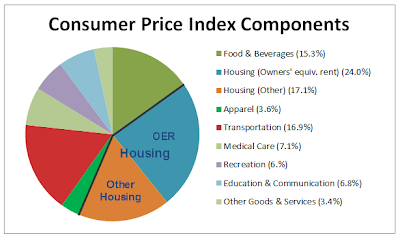 OER has the single largest weight of any component in the CPI, at 23.957%. Let's play "What If?" Specifically, "What if the BLS used actual home prices instead of OER in calculating the CPI?" 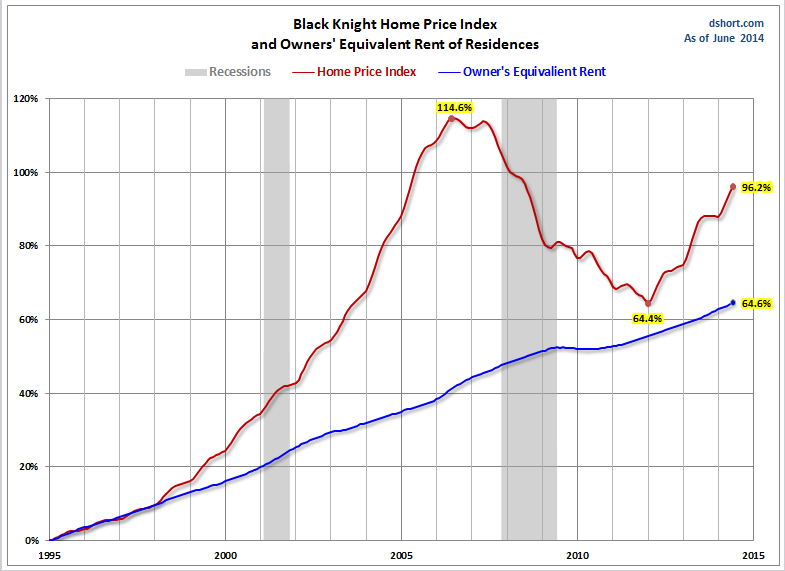 Periodically, Black Knight Financial Services provides the actual data behind their HPI (Home Price Index), a measure of actual prices. We can use that data to see what the CPI would look like if we put actual home prices in the CPI instead of OER. I call this the "HPI-CPI". I passed on an Excel spreadsheet of the Black Knight HPI aggregate housing prices to Doug Short at Advisor Perspectives and we produced the charts below. Let's start with a look at the rate of increase in home prices vs. the rate of increases in OER. As measured by HPI-CPI real interest rates were positive from mid-2006 all the way to 2010, even when the Fed Funds rate crashed to .25%. That shows the power of the housing crash and how badly the Fed misplayed the housing bubble. 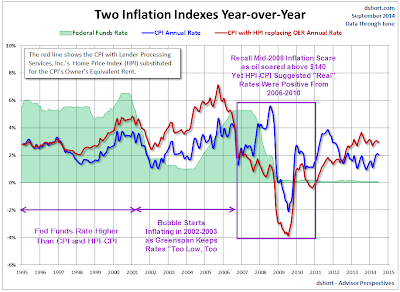 The above chart shows two measures of "Real" interest rates. 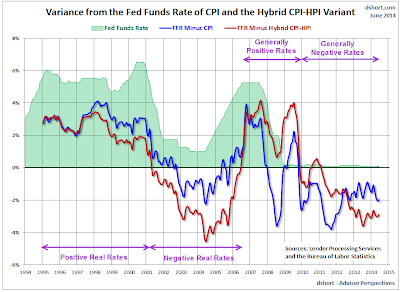 The Blue line is the Fed Funds Rate minus the CPI. The Red line is the Fed Funds Rate minus the HPI-CPI. Both measures show how the Fed has pushed real rates into negative territory. However, the rate of growth in home prices is slowing. If home prices actually start to decline, which I believe likely, HPI-CPI will show outright deflation. 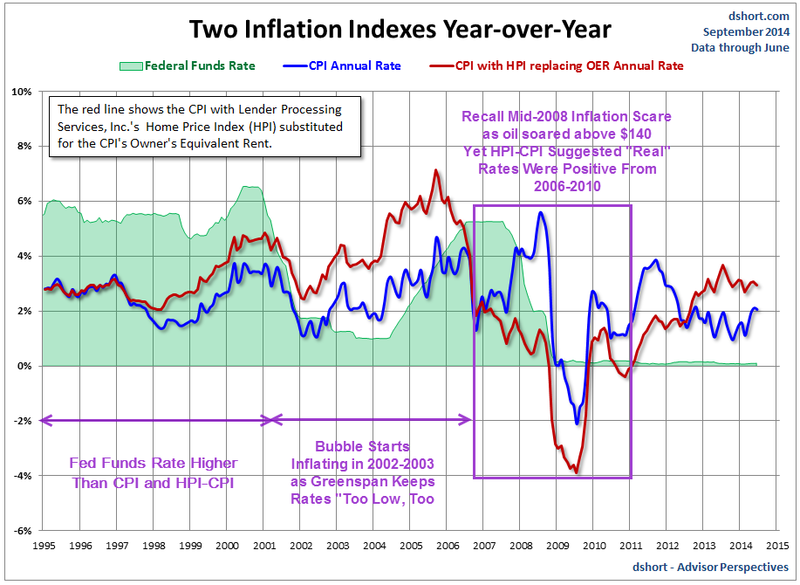 And even with the Fed Funds rate at 0.25%, real rates will again be positive as measured by HPI-CPI, but perhaps not by the Fed who uses the CPI as its measure of price inflation.